It’s Tuesday and yes I’m sharing a quote with y’all. 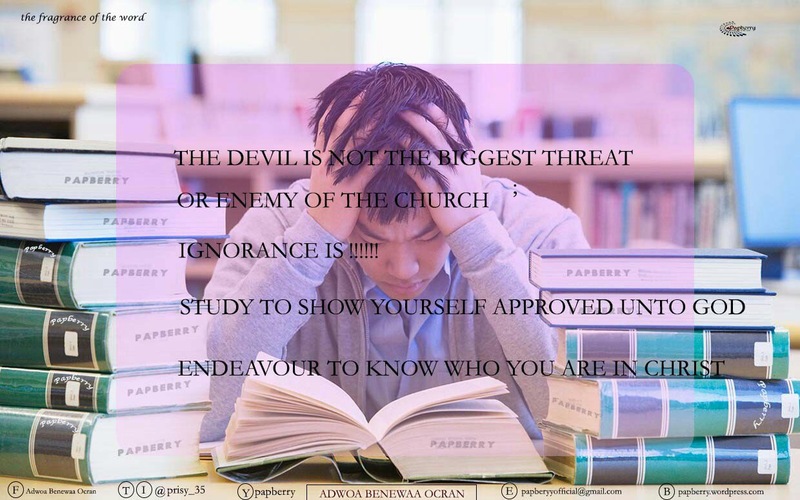 “The devil is not the biggest threat or enemy of the church-ignorance is”. Imagine that you are very hard on cash and someone owing you money deposits that amount in your account as he is supposed to, but forgets to inform you and you don’t also receive any notification to inform you of the deposit. You continue to struggle for basic needs not because you don’t have money but because you don’t know you have money. The enemy is always wild when people start searching for information and looking into who they really are and their rights. The means by which the enemy gets to us is deception, we buy into his well plotted schemes first ’cause of ignorance. I wanna dare you today to start searching, read, read and read, get knowledge, with that no one can lead you the wrong way! Now as Christians our way of life is scripted in the word of God and it is only when you study it that you will know that there is actually more to life than what the eyes behold. Study to show yourself approved unto God. Until we meet again, stay safe! It is ignorance of scripture upon which the evil one acts…he counts on our unfamiliarity of scripture to trick and use us for his bidding. You are so right when you encourage us all to study in context the word of God and defeat Satan! Thank you Steve for for comment. And you as well my young friend!